Russia bought another 300,000 troy ounces of gold in March bringing Russia’s total gold reserves to 1,861 tonnes or 60.8 million troy ounces as of the start of April, the central bank announced loudly at the weekend. The continuing robust and steady accumulation of gold reserves continues and it was notable how Russian media channels loudly (more loudly than usual it seemed with many outlets covering) pronounced the continuing diversification into gold bullion by the Russian central bank. It suggests that gold is being used as a bulwark to protect Russia from the stealth financial, trade and currency wars which appear to be deepening. Russia is not the only country diversifying into gold and many other countries are doing so as they seek to protect themselves from the coming devaluation of the US dollar and U.S. dollar hegemony. This is evidenced both by gold purchases and also in many strategic decisions regarding the storage of national gold reserves. While Russia was adding to its gold reserves, taking it above China’s holdings, Russia’s new ally Turkey was busy removing all gold bullion reserves held in the United States. Both are clear moves against US dollar hegemony. Gold reserve changes combined with the news that Russia and China have agreed to settle some trades in ruble and yuan is a clear step that the world’s super powers are looking to reduce dependence on the US dollar and the increasing move away from the US dollar as global reserve currency. Whilst it can be difficult to look past the Western media rhetoric regarding the likes of Russia, Turkey and China, there are lessons to be learnt by the everyday investor and saver. These moves have also been seen by western nations such as the Netherlands and Germany who recently made the decision to bring some (if not all) of their reserves back to Europe. Putin has long been on a mission to build up the country’s gold reserves after previous Russian governments ran the country’s reserves down to less than 300 tonnes. The current president has made it clear that the country should be holding gold, rather than US dollars. 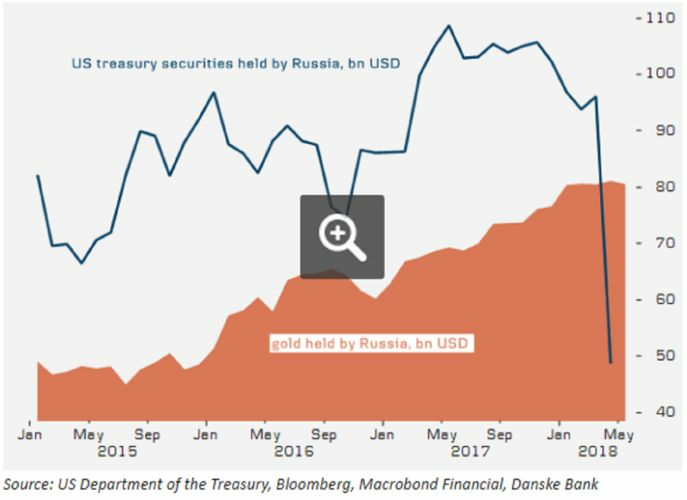 For many years, the Russian central bank has consistently bought gold, driven by Putin’s believe in the financial sovereignty offered by gold and its protection against geopolitical and economic risks. Putin first came to power in 2000 and since then the country has had more months than not, when it has purchased gold bullion. A large jump in reserves was seen in 2014 after Western sanctions were imposed and Russia has been the world’s largest gold buyer ever since. It is now the fifth largest gold holder after the United States, Germany, Italy, and France. Russia is also the third largest producer of the precious metal. As a result, the majority of its purchases are locally sourced, giving the country an additional edge when it comes to protecting its finances. This is something that China is also wise to. It does not allow the export of any gold mined in the country, further evidence of the desire to protect the country’s financial system and economy and position the yuan as an alternative to the dollar in the long term. The build-up of gold reserves by non-Western countries is something which could end up tipping the scales of the global order. Many believe that should bad relations continue between the US and these nations then US-denominated assets currently held in forex holdings by the relevant central banks, could be dumped for alternatives. Nations may opt to diversify into the Chinese yuan (in the case of Russia) but also gold. Most likely it would just take either Russia or China to do this, before many others followed suit. When loans are made in dollars, the debtor is instantly taken hostage by the issuing central banks’ policies. The central bank determines the price of dollar through monetary policy and it’s value thanks to currency printing. Were loans to be issued in gold these huge counter party pressures would no longer be a feature of the largely dollar based debt-system. China for many years has made it clear that gold purchased in China is to stay in China. Russia and Turkey are of the same belief. By removing gold from one jurisdiction to another you are making one very loud and political statement – we can look after our gold and we don’t want you anywhere near it. Decisions by both western and non western countries to repatriate their gold tells the US that they will no longer have power over their foreign reserves and that they do not trust them to look after them. Russia and increasingly Turkey and China are countries that are increasingly seen as threats to the West, in one form or another. As a result various measures have been taken against them to make international trade and negotiations very difficult. Whether through sanctions or trade tariffs countries are beginning to really feel the weight of the US and its allies’ powers. As a result, they are using gold to protect themselves and to protect their foreign exchange reserves and hard earned national savings. Investors can learn something here. Fiat currencies will always have a counterparty that is far more powerful than the saver or pension holder. There is rarely little interest by the fiat issuer to take note of how it’s currency management is affecting the individual’s savings and investments. Gold removes this risk. Central banks are unable to impact the supply or holding of physical gold that an investor holds legal title to and stores in a safe jurisdiction. The likes of Russia, Turkey and China recognise the financial independence holding gold bullion can bring, they also understand the importance of storing it at a location that cannot be compromised by western sanctions, central bank screw-ups, political targeting and nationalisation of gold assets and gold companies. Investors should follow suit and act as their own central bank. Prepare financially by having a sensible allocation to physical gold so that it is protected from central banks massive monetary experiment that risks destroying all hard earned wealth. Gold also serves to protect in times of heightened geopolitical risk, terrorism and war. Follow the same steps as these aforementioned countries – own physical gold, store in a safe jurisdiction and ensure you have legal title to your bullion through allocated and segregated bullion ownership. Shall we say that Putin is now in the "If you don't hold it you don't own it camp?" Heck, Putin should become a poster here because with that attitude he would fit right in. A member of Congress this week asked the U.S. Treasury Department and Federal Reserve to come clean about government policy toward gold. The congressman, U.S. Rep. Alex X. Mooney, R-West Virginia, sent a letter to Treasury Secretary Steven Mnuchin and Federal Reserve Chairman Jerome Powell raising issues similar to those GATA long has been raising about the U.S. government's surreptitious involvement in the gold market. Mooney wrote: "Records in the archives of the historian of the U.S. State Department describe U.S. government policy in recent decades as aiming to drive gold out of the world financial system in favor of the Federal Reserve Note or Special Drawing Rights issued by the International Monetary Fund. "Is this still U.S. government policy toward gold? If not, what is the U.S. government's current policy toward gold? "I have heard complaints that the U.S. gold reserve has not been fully audited for many decades, particularly as there seems to have been no acknowledgement of -- or account for -- 'swaps' and leases of gold or arrangements for such to which the U.S. government has been a party. "Does the U.S. government, through the Treasury Department, the Federal Reserve System, or any other agency or entity, transact in gold or gold derivatives either directly or through intermediaries? If so, what are those transactions and what are their objectives? "Does the U.S. government undertake any transactions in gold or gold derivatives through the Bank for International Settlements, Bank of England, or other central banks or governments? If so, what are these transactions and their objectives?" Mooney asked for responses in writing. GATA often has called attention to the surreptitious activity of the Bank for International Settlements in the gold market on behalf of its member central banks, which include the Federal Reserve. Stefan Gleason of bullion dealer Money Metals Exchange in Idaho, executive director of the Sound Money Defense League, which has been supporting Mooney's work on gold issues, said today that central bank efforts to demonetize gold have had "disastrous effects, particularly for the average American." "A return to sound money – that is, gold and silver -- would usher in a new era of investment, savings, stable prices, and fiscal discipline," Gleason said, adding: "We look forward to an explanation from Secretary Mnuchin and Chairman Powell regarding the government's activities using America's gold, including to what extent America's gold reserves have been put at risk or used for what might be viewed as dubious purposes." The willingness of a member of Congress to put to the Treasury Department and Federal Reserve specific questions like the ones GATA long has been pressing is especially encouraging. Not even Congress' last great gold advocate, former U.S. Rep. Ron Paul, R-Texas, could be persuaded to do that, the issue apparently being considered too sensitive to the international position of the United States and the U.S. dollar's status as the world reserve currency. Russia, China, and now Turkey? Is there something more to this scramble for gold? Additionally, discussion of Jeff Gundlach's recent prediction, rising rates, and Tesla. Any content within this video or any other video by the Silver Fortune channel is merely one man's opinion, commentary, and analysis, or actual information obtained from elsewhere, and should not be constituted as legal, investment, or financial advice. Make your own financial decisions, or consult a professional if you'd prefer to go that route. The Silver Fortune channel disclaims any liability for legal, financial, or investment decisions made. The U.S. gold exports to Hong Kong surged in February consuming nearly all of the domestic gold mine supply. According to the USGS recent Gold Mineral Industry Survey, February gold exports to Hong Kong more than doubled compared to the prior month. This was an interesting increase in gold demand from Hong Kong as the market price increased slightly month over month. Not only did gold exports to Hong Kong jump, but total U.S. gold exports also increased 40% from 36.1 metric tons (mt) in January to 50.4 mt in February. The top three countries that received the majority of U.S. gold exports were Hong Kong (15.5 mt), the United Kingdom (12.1 mt) and Switzerland (11.7 mt). According to the USGS table above, total U.S. gold mine supply for Jan-Feb was 33.7 mt. If we add up all U.S. gold mine supply and gold imports and subtract total gold exports, the United States suffered a net 16.6 mt deficit for the first two months of the year. Now that net deficit figure above does not include U.S. gold scrap supply or demand. However, I would imagine American gold demand was higher than gold scrap supply, so the net deficit is actually even higher. Regardless, the West’s gold continues to flow to the East. Even though the U.S. exported nearly 24 mt of gold to the U.K. and Switzerland in February, I would imagine a large percentage of that gold ends up in China, India and Southeast Asia. Please check out my next video that will show the Top Three Gold Miners Production cost versus the market price and how that compares to the Primary Silver Mining Industry and silver price. If you haven’t subscribed to my YOUTUBE Channel, please do so to receive updates on my new videos. You can subscribe here: SRSrocco Report YouTube Channel. Mike Gleason: It is my privilege now to be joined by a man who needs little introduction, Marc Faber, editor of The Gloom, Boom and Doom Report. Dr. Faber has been a long-time guest on financial shows throughout the world, and is a well-known Austrian economist and investment advisor, and it's a tremendous honor to have him on with us today. Dr. Faber, thanks so much for joining us again, and how are you? Marc Faber: Well, it's my pleasure to be on your show. Thank you. Mike Gleason: Let's start out here with the equities Marc. Now the U.S. stock markets peaked in late January and made their lows for the year in early February. Stocks have been trading in a range since, but are currently pushing back towards those lows as volatility has certainly picked up. If you had to guess about which way the markets are likely to break from here, what would it be, and do you think we've seen the top for 2018 or can speculators keep pushing the markets higher for a bit longer? Marc Faber: That's a good question and I think everybody's interested in the answers and everybody has a different view, but I have maintained that the January 26th high for the S&P up 2,872 was like a mirror image of the low on March 6th, 2009 when the S&P was at 666. At that time, everybody was bearish and leading strategy and I don't want to name who, but they were predicting for the S&P to fall to 400. And what happened is that, because sentiment was so negative, and the market was so oversold, the market turned around and actually on very poor earnings, started to go up. And now, we have, in January, a high, when everybody felt that the market would go higher and what then happened is that on good earnings, stocks didn't move up, but started to go down. So, I think we are in a situation where it is likely, it's not yet a hundred percent sure, in order to get a clearer picture, if a major bear market has started, we would have to make a low below the February low, but that hasn't happened yet. But looking at the market and the market action and the momentum and the number of stock that are actually making new lows, I'd say there is a fair probability that the market will disappoint point very badly. Mike Gleason: Dr. Faber, it seems to us that the fate of precious metals markets is tied pretty closely to stock prices, at least in the near term. We lack either fear or greed to drive any trend change. Here in the U.S. there's very little demand for safe-haven assets. If you look at sentiment in the metals markets you'll find that the greed factor is also missing. Now that could all change if gold and silver can catch investors' attention by significantly outperforming stocks for a while longer or if we get the long overdue correction stocks. Now Marc, you wrote recently about two items you feel would signal a major top in the equity markets. The first had to do with the public going all-in, coupled with an excessive amount of speculation. The second would be the revelation of a major fraud. Those items will be familiar to anyone who had taken a good look at the 2008 financial crisis. Are you expecting history to repeat itself here? Marc Faber: Well, I think there is a lot of disinformation, and usually when stocks go down, some fraud comes to the surface. And I expect it to happen, and I mean in a major way. Whether the fraud is related to some corporation, which I think is quite likely, or whether it's related to the fraud that is going on in the pension fund system, where pension funds are grossly underfunded, and, in the future, will either have to increase contributions or reduce distributions. I think these are items that could happen. Secondly, the public may start to lose faith in the system because of the political situation. I think the political situation in the U.S. is very bad, and If you read about what has been happening at the FBI, the CIA in Washington, you have to scratch your head whether that is all possible in a system that is supposedly functioning. It's like Watergate, but actually magnified. So, I think there is a possibility that investing public loses interest in financial assets. You talked about precious metals. I think there has been, just recently, a huge short position in the dollar. In other words, speculators, 15 months ago, they were heavily long in the dollar, and now they are very heavily short dollar. I think the dollar may rebound and as a result, precious metals may not move up right away. I think, eventually, they'll move up, but for the next, say, one or two months, I don't see how precious metals would rally significantly. Mike Gleason: Getting back to politics here for just a moment, it does appear that we may be on the verge of a global trade war. What are your thoughts on the tariffs being imposed by the Trump administration on China, and how do you envision that playing out? Marc Faber: My view is that, actually, the Trump administration, for which, I would have voted for Mr. Trump, but he proves every day that he's a completely clueless individual. He says one thing and then does something totally different. He changes his view all the time. And I think, quite frankly, there is a trade war which maybe won't happen, but if there is one, the U.S. will be the big loser, because consumer prices in the U.S. will go up and that is not desirable at the present time, as the Fed is already tightening and interest rates have been rising, so what it will mean is, if there is a trade war, initially the dollar will actually rally. But this is precisely what the U.S. shouldn't have, a very strong dollar. Mike Gleason: Turkey is the latest nation to announce that they will repatriate their gold, joining a number of other countries who have declared they will do the same. What does this say about the confidence in the system, and then what do you think these countries are positioning themselves for? Basically, why are they doing this? Marc Faber: Well, I think the question should be: why did they actually hold gold in the U.S.? I personally think that, to hold your assets that are like a safe-haven, in another country is a risk by itself… so I understand all these countries. And secondly, I think for the first time in Bretton Woods, we have less confidence or less faith in the U.S. dollar as a reserve currency. I think the U.S. policymakers, especially the Neo-cons, had the talent to antagonize Mr. Putin and also Mr. Xi in China. By doing that, they have actually managed to get them closer into an economic and political alliance. And the goal of these two countries, Russian and China, is probably to gradually move away from a dollar system. I'll tell you, I personally, I'm not a U.S. citizen, I'm just an international observer of economic, financial, and political trends. I cannot imagine a foreign policy that would be worse for the U.S. itself than what the Neo-cons have engineered. I just can't imagine. Mike Gleason: Yeah, that's a very fair point, there. Speaking of oil and the petrol dollar, oil prices have been moving up steadily for a while now. Do you envision a broader commodity rally taking place here, and then maybe could that benefit precious metals in the long run? Marc Faber: Well, a lot of industrial commodities have been rallying because of commodities-related circumstances, like aluminum rallies because of the trade embargo against Russia, and so forth. But if I look at industrial commodities, I rather have the feeling that they will come down. Why? I think the increase in interest rates in the U.S. on the 10-year treasury note from 1.38 percent in the summer of 2016 to the current level of over three percent, in other words, we more than doubled in the yield in the bond market. And for the two-year treasury, we have been going up between 10 and 20 times depending how you measure it. I think these interest rate increases will slow down the U.S. economy, and probably bring about a recession. Mike Gleason: We talk a lot about the appetite for gold in other parts of the world. Do you ever see the tide changing when it comes to the importance of gold ownership? We know Asians are buying it relentlessly and so are many folks in Europe. On the whole that mindset definitely hasn't made it here to the U.S. yet, but do you sense that may be coming, and if and when it does, do you foresee any problems with being able to get the physical metal once the masses do finally decide to pour into it as the ultimate safe-haven? Marc Faber: That's a good question. We had a total neglect of gold and other commodities in 1999, and then gold rose from $255 to a peak in September 2011 of $1,921. At that time, there was a lot of speculation in gold and in other precious metals and other commodities. And since then we've been at a bear market until December, 2016, when gold approached $1,000. Since then, as you know, we've been up something like 30 percent, and it is true, there is some speculative interest in gold, but nothing compared to crypto-currency. People that look for an alternative to paper assets like bonds and equities, they're all gambling on cryptos. I don't think that cryptos are safe. Now they may move up and they may move down but I, as an investor for the ultimate crisis, I prefer to be in physical precious metals, gold, silver, platinum. I think, eventually, these precious metals will come back into the investment portfolios of major institutions and individuals. The major institutions of the world, they hold practically no gold. They have more money in Apple, they have more money in Amazon, than, say, in gold. And I think that will change over time, but I don't know whether it will be tomorrow or in three years’ time, but my view would be that if you really look at the financial situation, the unfunded liabilities, the government deficit, the inflated asset prices, the conclusion is central banks will have to continue to print money, otherwise the system collapses. That, in my opinion, will boost precious metals prices. Mike Gleason: As we begin to close, here, Dr. Faber, one of the things we value most about your perspective is that you don't live in the U.S. More than most people, you're tuned into what's happening elsewhere, particularly in Asia and Europe. As for Americans, they can't seem to get their eyes off the political theater in Washington, and to be fair, there's never been a show quite like the one we have today, but is there anything of note that Americans are overlooking, and what stories are you going to be watching most closely as we move throughout the year? Marc Faber: Well, I don't want to criticize the U.S., because in other countries it is not much better. But the one thing I want to say is the following: Americans have been growing up and they've been brainwashed that America is a superpower and they have been educated in the belief of the American exceptionalism. And I just want to say that lots of countries in this world have a different perspective of the world. In particular, if you look at China, it has four times the population of America. Its industrial production is larger than in the U.S., their land mass is larger than the U.S., and they're growing at a much faster pace. They have, in my opinion, no territorial ambitions, but they don't want to be controlled by the U.S. that has, in Asia, countless military and naval bases. They (China) look at the world from their perspective, and the U.S. would do well to consider other leaders' perspectives, including Xi Jinping and Mr. Kim Jong-un, and Mr. Putin, of course. But if you only look at the world from your perspective, undoubtedly some trouble will arise. And what most Americans don't see, they have kind of a tunnel vision where the tunnel starts in America and looks at the whole world, whereas other countries, they have another view of the world than the U.S.
And I think it's very important, both economically and politically to consider the point of view of other countries that, by the way, have become very powerful. Mike Gleason: Yeah, very well put. We'll leave it there, and Dr. Faber, thanks so much for your time and for staying up late with us today in your home in Thailand. It was a joy to speak to you again. Before we let you go, please tell people how they can subscribe to The Gloom, Boom and Doom Report so they can follow your great commentaries on a regular basis. Marc Faber: Thank you very much. I have a website called www.GloomBoomDoom.com. There, they can choose either a printed version of The Gloom, Boom and Doom Report or the website report, or both. Mike Gleason: Excellent stuff. Once again, it's been a real privilege to speak to you, Dr. Faber, and I hope we can do it again in not too distant future. Thank so much for joining us. Marc Faber: It was a pleasure talking to you and to your listeners. Thank you. Mike Gleason: Well, that will do it for this week. Thanks again to Dr. Marc Faber, editor and publisher of The Gloom, Boom and Doom Report, again the website is GloomBoomDoom.com be sure to check that out. $110,000 Of Gold MISSING From Royal Canadian Mint! Employee Fired! What Can Alchemists Say About Gold? Alchemists are precious metals experts, aren’t they? So let’s see what we can learn from the latest issue of the Alchemist, the LBMA’s quarterly journal. Silver has been always in gold’s shadow. Could the accelerated and synchronized global growth finally boost silver? In his article, Jonathan Butler offers two arguments in favor of higher silver prices. First, in a world of synchronized growth, silver should outperform gold, as it has a much larger industrial base. In particular, the solar sector and vehicle electrification are very promising areas for silver demand. Second, silver seems to be undervalued. Historically, one needs 58 ounces of silver to buy an ounce of gold, but now it would take around 80 ounces. We generally agree with Butler. We don’t believe that gold-to-silver ratio has to reverse to the historical mean, but in the current macroeconomic environment silver could indeed outperform gold. However, this is not happening, as gold benefits from the safe-haven demand. And investors should remember that silver usually catches up later in the precious metals bull market. Michael Bedford provides an analysis of the gold mining sector. As the price of gold was rising in the 2000s, mining companies launched expansion plans financed by debt. But when the yellow metal prices peaked at almost $1,900 to fall to about $1,100, the market capitalization for the sector fell far quicker and further. In response, managers started to repair their balance sheets and improved the companies’ cash flows. This is why the total expenditure and production fell. However, some companies have over-cut capital savings – and now investment in exploration and new projects must resume. So it is worth investing now in the gold stocks? The article suggests that not necessarily. Mining companies still prioritize cash flow, so meaningful growth seems a distant dream for some producers. And dividends are rare in this sector, with thin yields. Mining stocks may provide leverage relative to gold prices, but it’s a double-edged sword, as managers learned during the last bear market in gold. And we would like to analyze the transcript of Jagjit Chadha’s keynote lecture “Monetary Policy in an Era of Political Uncertainty” at the LBMA Conference in Barcelona on October 16, 2017. He starts with the observation that the last ten years were quite odd for the advanced economies. Both productivity and wages are low. The process of sustained economic progress has been hampered. The policymakers’ idea here was to help economies that had high levels of private debt adjust to lower levels of private debt without falling off a cliff-edge, so the interest rates were lowered to zero, but it didn’t boost production. The author presents an interesting argument behind the stubbornly low interest rates. The share of Asian economies in the world GDP increased substantially over the last 20 years. This is very important, as these emerging countries have different preferences over savings and investment than the advanced economies. Hence, real interest rates decreased, increasing asset prices and generating challenges for monetary policy. If Chadha is right, low interest rates should stay with us, which should provide a support for gold prices. The bottom line is that the LBMA has recently released the new edition of “Alchemist”. As always, it includes several interesting articles. The three most important take-home messages are as follows. First, silver seems to be undervalued relative to gold. Second, gold shares can provide some leverage relative to bullion prices, but the growth potential of mining companies is limited due to the focus on cash flow and reduction in capital spending. Third, low interest rates could be more permanent than we thought, as Asian economies have a different propensity to save. It should be positive for gold, which does not like high yields. Stay tuned! One dealer bankrupted in 2016 with two of its directors indicted in April 2018 on fraud charges. The other dealer still gets over from its 1980’s branding yielding high volumes of google searches, and thus possibly churning and burning new novice customers every day. Allegations of fraud total $362.5 million USD in lost customer and vendor funds combined. Apparently there’s gold in them there trash cans!! At least in South Korea. It seems a janitor was doing his daily routing when he lifted an unusually heavy bin of refuse. Upon further investigation, the janitor who wishes to remain anonymous ( can’t blame him!! ), found 7 kilo bars of gold worth $325,000. It doesn’t matter if the owner ever claims the 7 kilos or not as the janitor will receive a “finders fee” between 5 and 20% of the total value. How awesome would it be to come home from a hard-days work doing a thankless job and have somewhere between 1 and 7 kilos of gold? WOW! My guess is the janitor enthusiastically showed up to work the next day and whether anyone thanks him or not he has the gold and now has tears of the Sun reigning down in his life! Putin himself isn't a Gimmer, but don't think the Russians didn't frequent this site while they were rebuilding Russia after the Soviet collapse. This site and the few others who all promoted G O L D for the past 20 years. Gold was up half a percent year-to-date through last Friday. This doesn’t sound very exciting, but over the same period, the S&P 500 Index was in the red—the first time in nearly a decade that stocks have been negative for the year through the beginning of May. The yellow metal is doing the one thing for which many investors have it in their portfolio—namely, it’s trading inversely to the market. This highlights its longstanding role as an attractive diversifier and store of value. Gold has been under pressure from a strengthening U.S. dollar, and May has historically delivered lower prices. As I’ve pointed out before, this makes it an ideal entry point in anticipation of a late summer rally before Diwali and the Indian wedding season, during which gifts of gold jewelry are considered auspicious. Demand in China for the remainder of the year also looks promising. India’s demand for gold jewelry in the first quarter was down 12 percent from the same period last year, according to the latest report from the World Gold Council (WGC). Consumption fell to 87.7 metric tons, compared to 99.2 tons in the first three months of 2017. Contributing to this weakness was the fact that there were fewer auspicious days in the first quarter than in the same period of the past three years, according to the WGC. However, this followed a monumental fourth quarter 2017, when gold demand in the world’s second-largest consumer was 189.6 metric tons—an all-time record—so a decline was expected. Looking ahead, it’s estimated that India will have a “normal” monsoon season this summer. This is good news for gold’s Love Trade. A third of India’s gold demand comes from rural farmers, whose crop revenues depend on the rains from a healthy monsoon. When the subcontinent experiences a drought, as it did in 2014 and 2015, gold consumption suffers. In China, the world’s largest importer of gold, jewelry demand rose 7 percent in the first quarter to 187.7 metric tons, a three-year high. According to the WGC, Chinese retailers are working on improving the customer experience, providing consumers with “a more holistic retail solution.” The industry is expecting a strong 2018 after a relatively subdued 2017. Except for a weak February, demand so far this year has been particularly strong, with monthly withdrawals from the Shanghai Gold Exchange (SGE) above the two-year average of 170 metric tons. April represented the third straight month of rising demand. Withdrawals were 28 percent higher than in the same month in 2017, according to veteran precious metals commentator Lawrie Williams. Williams writes that fears of a potential trade war with the U.S. could be driving Chinese investors into safe haven assets, including gold bars and coins. Indeed, the WGC reports that bullion demand in the first quarter finished at 78 metric tons, above the three- and five-year averages. I believe this all bodes well for the Love Trade going forward, meaning it might be an opportune time for investors to consider increasing their exposure to gold and gold mining stocks. As always, I recommend a 10 percent weighting, with 5 percent in bars, coins and jewelry, and 5 percent in high-quality gold stocks, mutual funds and ETFs. How Central Bank Gold Buys Impact Market Gold Prices! Who Owns Most Of The World's Gold? The Largest Gold Heist In American History! Which way is gold headed? Will 2018 be the time for Gold’s major move, and why or why not? And how safe are the most important options for you to seriously consider for storing your gold? Alasdair MacLeod, head of research at GoldMoney.com, returns to ReluctantPreppers to dive deeply into the trade-offs that can seem bewilderingly complex about gold storage. MacLeod exposes some of the weaknesses in the most popular gold storage schemes, and gives preparedness-minded individuals some solid choices to adopt a balanced storage approach that’s likely to serve us well through the uncertain times ahead! From 1966 to 2018 Greenspan has stood up for gold. If the masses hold him in such high regard why don’t they listen to what he says about gold? Gold is money and everything else is credit (debt) – what is so difficult to understand about this simple truth? Welsh Gold Being Hyped Due To The Royal Wedding? Is ‘Welsh gold’ more valuable than gold mined from anywhere else? Some believe it is. Others believe this is just hype ahead of the big day for Harry and Meghan. Since 1923 various members of the British Royal family have chosen to use Welsh gold in their wedding rings. Famous wearers include Queen Elizabeth II, her daughter Princess Anne, Princess Diana and the Duchess of Cambridge. This, combined with the fact that there is no active Welsh gold mine today confers on “Welsh gold” a certain exclusivity. The prices charged for Welsh gold very much play on this desire for it to be seen as the ‘rarest’ and most ‘sought after’ gold in the world. In reality the rarest thing about it is the lack of Welsh gold in the jewellery and other items claiming to be “Welsh gold”. Welsh gold jewellery made today is likely to contain far less than 1% of the exclusive metal. The rest of the piece will be made up of gold from elsewhere. Gold has many uses. For some it is for wedding rings, for others it is the backbone of internet technology, for millions it is financial insurance and a store of value. Each industry impacts the other as they clearly affect demand and supply. Very rarely does one industry claim to play the role for another. Except in the case of Welsh gold. As a result of both the 2011 and upcoming Royal Weddings there have been several reports regarding Welsh gold and its value. Welsh gold is not for the exclusive use of the royals. There is now jewellery to buy with the ‘Welsh gold’ label. Promising the wearer that they are adorned by the ‘Gold of Royalty’. Many make it sound as though Welsh gold is a sure fire investment, even more so than ‘normal’ gold. This is misleading. Currently Welsh gold is predominantly used in jewellery and other artisan items. A premium is placed on the items because of the provenance of less than 1% of the total gold use in the piece. It is estimated that the markup on a diamond wedding and engagement ring is between 300% and 1000%, with a tendency towards the lower end of the scale. The chances of us seeing this back are unlikely in the extreme as a buyer will only take into account the components of the jewellery rather than the purchase price. Why is the gold considered to be rare? Because the gold used in Welsh gold jewellery today comes from mines that are no longer in use. It is not because it is different to any other mined gold. It is not purer than other jewellery and it has no evidence of being a better investment than any other item or gold for investment. This means that is as rare as the gold that has been mined for thousands of years around the globe and continues to be today. Today, gold is rarer than it has ever been. Welsh gold is a great thing for the British Isles to have. It has a long history and its connections with the Royal family certainly makes it feel very special. However, it is a romantic notion that its provenance makes it more valuable. If you wish to hold gold as part of a balanced portfolio then buy investment grade gold, for example a bullion bar or sovereign coin. Do not think that an item of jewlery (no matter its history) will afford you the same protection and return on investment. When you buy gold bullion for your portfolio ensure it is of a purity not less than 995 thousandths or 99.5% pure. It must be in the form of a bar, or of a wafer, of a weight accepted by the bullion markets. The bullion must be immoveable and stored with a secure third party. It cannot be taken possession of. Ensure it is stored in allocated and segregated storage. The purity is important here, unlike with Welsh gold jewellery you must know how much gold is in the bar. Do not be dismissed by the seller to be told that ‘we try not to stipulate’ how much gold is in the bar ‘because it puts us on the hook’. This is not good enough for an investment product. Buy your gold from a trusted dealer, long established dealer and own gold in the safest way possible – allocated and segregated. With investment grade 0.9999 pure gold, there will be no quibbles regarding its price should you wish to sell it in the future and it will always be liquid. Something which cannot be guaranteed with jewellery, Welsh or not. There seems to be a lot of misinformation being peddled on the internet about gold and bitcoin. One major misconception is the notion that bitcoin will replace gold as a monetary instrument. Some analysts, once stanch precious metals advocates now turned crypto aficionados, believe in such theories that there is too much gold in the world to be used as money or that it is now just a barbarous relic. Just a year or so ago, these same supposed analysts were criticizing the Mainstream media financial network talking heads for calling gold as a barbarous relic, but now have jumped on the bandwagon. Well, in one small way, who can blame them. It has been frustrating holding onto gold and silver patiently waiting for their inevitable rise. So, when Bitcoin and the crypto prices moved up exponentially last year, promising investors vast riches in the future, it was easy for many to drop the precious metals and move into the crypto market. The mindset today is to make lots of money doing nothing. Thus, it’s not surprising to see many fall into this delusion and way of thinking. A few of the crypto aficionados tell their followers that gold can’t be a monetary asset because there are millions of tons of gold hidden in secret vaults or that there are billions of ounces locked away in the Grand Canyon. While this may sound like quite an interesting conspiracy, there is no sound evidence to back it up. To believe in these fanciful conspiracies defies all logic. However, with the logic being in short supply currently, I am not surprised that many believe in these fairy tales. Of the total 190,000 mt of the world above ground gold stocks, jewelry consists of 48%, private investment 21%, Central bank 17%, and Industrial and other at 14% (Source: World Gold Council – Total above-ground stocks 2017) So, if we realize that nearly half of all above-ground gold stocks are in the form of jewelry, and then another 21% is owned by private investors, Central banks DO NOT own most of the gold. Even if we compare private investment to Official holdings, private investors own more gold than Central banks. Now, to the incorrect theory that there are millions of tons of gold in the world, can someone please tell me where all this additional gold came from?? If we understand that the increase in gold mine production paralleled the rise in silver and copper production, how could there be 10-20 times more gold than copper and silver??? According to the best data, we can get our hands on, 91% of all gold mined since 1493 was produced after 1900. Limited records of gold produced before 1493 suggest that wasn’t more than 10,000-15,000 mt. Of the total 48.5 billion oz of silver mined in the world between 1493 and 2016, 81% of it was produced after 1900. Also, the amount of silver mined annually compared to gold has been about 10 to 1. Assuming that total historical silver production was approximately 55 billion oz compared to 5.7 billion oz of gold, it turns out to be nearly a 10/1 ratio. For there to be just 1 million tons of gold in above-ground stocks in the world, that would equal 32 billion oz of gold. Considering a 10/1 ratio of silver to gold production, then we should have mined 300+ billion oz of silver, not the 55 billion oz stated by the world authorities. So, if we understand the logic here, why on earth do people continue to believe in the LOUSY CONSPIRACY that there are millions of tons of gold in the world?? Why, because lousy conspiracies sell a hell of a lot more newsletters and subscriptions than those that put out the facts and fundamentals. Regardless, Central banks own less gold than above ground jewelry stocks or private investors. While Central banks are controlling the gold and silver prices by funneling 99%+ of investors into stocks, bonds, real estate and cryptos, they cannot manipulate the price of precious metals too far below their cost of production. Unfortunately, the crypto aficionados do not understand energy or the cost of production as a FLOOR for the gold and silver prices. Which means, the Central banks cannot push the price of gold and silver anywhere they please. What the Central banks CAN DO, is that they can BAMBOOZLE the public in putting their funds into the biggest Ponzi Schemes in history. By funneling the public’s money into stocks, bonds, and real estate, this caps the gold and silver price. This is the manipulation. Now, the notion that Bitcoin will replace gold as the King Monetary Asset is patently false because Bitcoin fails several important tests. First, Bitcoin trading volatility is too high to be used as a currency. I have heard from several people that using Bitcoin as a payment method is very frustrating because the price can fluctuate $1,000 in a very short time, thus making it a very stressful transaction for both buyer and seller. Bitcoin’s 30-day volatility of 3.73% is nearly 9 times more gold and 10 times more than the USD/EUR (US Dollar-Euro). While Bitcoin’s volatility could continue to decline in the future, it still needs a very high-tech electronic system to allow trade and payment. Secondly, Bitcoin and cryptos will not function well as the EROI of energy continues to fall, destroying the ability to scale up or maintain high technology. I recently watched a documentary about the Dark Ages on the history channel. After the fall of the ancient western Roman Empire (5th century), people who lived around the once great city in the 6th and 7th century knew that life was better in the past because they saw all these massive buildings and structures, but were now living mostly a peasant’s life. In just 3-4 generations, people no longer remembered what it was like to live in Rome during its heyday. The great culture, technology, food, and trade of the ancient Roman Empire were gone for good. Most Americans today have no idea what life is like after a collapse of society. Not only will Bitcoin and the cryptos not survive the coming Falling EROI energy collapse, either will most of the advanced technology. Sure, some technology will be around, but it will claim the same fate as the ancient Roman Empire. For this reason, gold will always remain the KING MONETARY METAL and asset. Unfortunately, the crypto aficionados do not understand the Falling EROI of energy as they mislead their followers into investing in just another fly-by-night bubble. Does Gold Still Hold Value As It Did For Over 5000 Years? On May 4 and 5, 2018, Warren E. Buffett (born 1930) and Charles T. Munger (born 1924), both already legends during their lifetime, held the annual shareholders’ meeting of Berkshire Hathaway Inc. Approximately 42,000 visitors gathered in Omaha, Nebraska, to attend the star investors’ Q&A session. Peoples’ enthusiasm is understandable: From 1965 to 2017, Buffett’s Berkshire share achieved an annual average return of 20.9 percent (after tax), while the S&P 500 returned only 9.9 percent (before taxes). Had you invested in Berkshire in 1965, today you would be pleased to see a total return of 2,404,784 percent: an investment of USD 1,000 turned into more than USD 24 million (USD 24,048,480, to be exact). In his introductory words, Buffett pointed out how important the long-term view is to achieving investment success. For example, had you invested USD 10,000 in 1942 (the year Buffett bought his first share) in a broad basket of US equities and had patiently stood by that decision, you would now own stocks with a market value of USD 51 million. With this example, Buffett also reminded the audience that investments in productive assets such as stocks can considerably gain in value over time; because in a market economy, companies typically generate a positive return on the capital employed. The profits go to the shareholders either as dividends or are reinvested by the company, in which case the shareholder benefits from the compound interest effect. Buffett compared the investment performance of corporate stocks (productive assets) with that of gold (representing unproductive assets). USD 10,000 invested in gold in 1942 would have appreciated to a mere USD 400,000, Buffett said – considerably less than a stock investment. What do you make of this comparison? To answer this question, we first need to understand what gold is from the investor’s point of view. Gold can be classified as (I) an asset, (II) a commodity, or (III) money. If you consider gold to be an asset or a commodity, you might indeed raise the question as to whether you should keep the yellow metal in your investment portfolio. But when gold is seen as a form of money, Buffett’s comparison of the performance of stocks and gold misses the point. To explain, every investor has to make the following decisions: (1) I have investible funds, and I have to decide how much of it I invest (e.g. in stocks, bonds, houses, etc. ), and how much of it I keep in liquid assets (cash). (2) Once I have decided to keep X percent in cash, I have to determine which currency to choose: US dollar, euro, Japanese yen, Swiss franc – or “gold money”. (1) I do not keep cash, because stocks offer a higher return than cash. However, many people are unlikely to follow such a recommendation. They keep at least some liquidity because they have financial obligations to meet. People typically also wish to hold liquid means as a back-up for unforeseen events in the form of money. Money is the most liquid, most marketable “good”. Anyone who has money can exchange it at any time – and thus take advantage of investment opportunities that come up along the way. (2) I decide to keep at least some cash. Anyone who has near-term payment obligations in, for example, US dollar, is well advised to keep sufficient funds in US dollar. Those who opt for holding money for unexpected liquidity requirements, or for longer-term liquidity needs, must decide what type of money is suitable for this purpose. One way to do this is to form an opinion about the respective currency’s purchasing power. If Buffett shared this view, a comparison between the purchasing power of the US dollar and gold would be in order. This exercise would show that gold – in sharp contrast to the US dollar – has not only preserved its purchasing power over the past decades but even increased it. The Greenback’s purchasing power has dropped by 84 percent from January 1972 to March 2018. Even taking a short-term interest rate into account, the US dollar’s purchasing power would show an increase of no more than 47 percent. The purchasing power of gold, in contrast, has grown by 394 percent. The yellow metal has also a remarkable property that has become increasingly important for investors in recent years. The reason? The international fiat money system is getting into increasingly tricky waters – mainly because the world’s already dizzyingly high level of debt continues to rise. An investor is exposed to risks that have not existed in the decades before. Gold can help to deal with these risks. Unlike fiat money, gold cannot be devalued by central bank monetary policy. It is immune against the printing of ever greater amounts of money. Furthermore, gold does not carry a risk of default, or a counterparty risk: Bank deposits and short-term debt securities may be destroyed by bankruptcies or debt relief. However, none of this applies to gold: its market value cannot drop to zero. These two features – protection against currency devaluation and payment default – explain why people have opted, whenever they had the freedom to choose, for gold as their preferred money. Another important aspect at this point: In times of crisis, the holder of gold – if he or she has not bought it at too high a price – can have the hope that the value of gold is likely to increase and he or she can exchange gold for, for instance, shares at a significantly discounted price. This way, gold can help boost the return on investment. Inspired by Buffett’s return comparison between stocks and gold, and after giving it some further thought, one might have good reasons to come to at least the following conclusion: Gold has proven to be the better money, it has proven itself to be a better store of value than the US dollar or other fiat currencies. The two-star investors typically do beat around the bush when it comes to critical comments. For instance, Buffett told his audience once again that US Treasury bonds are a terrible investment for long-term investors. With a yield of currently 3 percent for ten-year US Treasury bonds, the return after tax is around 2.5 percent. With consumer price inflation currently around two percent, inflation-adjusted rate of return is just 0.5 percent. Buffett’s message was unequivocal: do not invest, at least not currently, in bonds. Those who had hoped that the star investor would make further critical comments on the deep-seated problems of the US dollar – which represents a fiat currency with a money supply that can be increased any time in any amount considered politically expedient – had hoped in vain. But it cannot have escaped the star investors that it’s not all sunshine and roses when it comes to the fiat US dollar. Munger, for example, bluntly stated that central banks’ low interest rate policies, in response to the 2008/2009 financial crisis, have helped boost stock prices and bring shareholders windfall profits. Quote Munger in this context: “We are all a bunch of undeserving people, and I hope we continue to be so”. Buffett and Munger share a long-term perspective. They keep pointing to the enormous increase in income that has been achieved in the US over the last decades. Compared to Buffett’s childhood days, Americans’ per capita income has increased six-fold – a most remarkable development (especially so if we factor in that the US population has grown from 123 million in 1930 to 323 million in 2016). From Buffett’s and Munger’s point of view, the US system works, both politically and economically: Everyone has benefited, the wealth growth of Americans has been much more substantial than for people elsewhere, and crises have been overcome. The two investors thus form their assessment – as many do nowadays – on factual findings, based on what the eye can see. Counterfactual outcomes – things that would have happened had a different course of action been chosen – are left out. If one takes a factual point of view, however, it is rather difficult not to see the dark side of fiat money. For instance, that fiat money fuels an incessant expansion of the state to the detriment of civil liberties; the increase of aggressive interventions around the world, all the wars causing the deaths of millions; the economic and financial crises with their adverse effects on income and living conditions of many people; and last but not least, the socially unjust distribution of income and wealth. All these bad things would undoubtedly be unthinkable under a gold-backed US dollar, at least to their current extent. The objection that the increase in the wealth of the past few decades would have been impossible without a fiat US dollar does not hold water: Economically speaking, it is wrong to think that an increase in the quantity of money, or a politically motivated lowering of the interest rate, could create prosperity. If that were the case, why not increase the quantity of money ten-, hundred-, or thousand-fold right now and thereby eradicate poverty worldwide? If zero interest rate could create wealth, why not order central banks to push all interest rates down to zero immediately? Why not enact a new law that requires zero percent interest, or abolishes it altogether? Buffett and Munger have undoubtedly given their shareholders a great opportunity to escape the vagaries of the fiat money system, to defend themselves against the central bank-induced inflation, and to also become wealthy. Unfortunately, however, the serious economic, social, and political problems that fiat money inflicts upon societies cannot be solved this way. For that reason, one should deliberately reflect Buffett’s return comparison between stocks and gold – and make oneself aware of the fact that gold can be viewed as a form of money that may even deserve to be called “the ultimate means of payment.” For the investor, there are no convincing economic reasons to discourage holding gold as a form of longer-term liquid funds – especially if the alternative is fiat money. How Low Will Gold Go Before The Price Rises? World Gold Council: Gold Healthy For Next 30 Years! This blog post is a guest post on BullionStar's Blog by the renowned blogger JP Koning who will be writing about monetary economics, central banking and gold. BullionStar does not endorse or oppose the opinions presented but encourage a healthy debate. With Donald Trump close to re-instituting economic sanctions on Iran, it's worth remembering that gold served as a tool for skirting the the last round of Iranian sanctions. If a blockade were to be re-imposed on Iran, might this role be resuscitated? The set of sanctions that the U.S. began placing on Iran back in 2010 can be best thought of as a monetary blockade. It relied on deputizing U.S. banks to act as snitches. Any U.S. bank that was caught providing correspondent accounts to a foreign bank that itself helped Iran engage in sanctioned activities would be fined. To avoid being penalized, U.S. banks threatened their foreign bank customers to stop enabling Iranian payments or lose their accounts. And of course the foreign banks (mostly) complied. Being cut off from the U.S. payment system would have meant losing a big chunk of business, whereas losing Iranian businesses was small fry. One of the sanctioned activities was helping Iran to sell oil. By proving that they had significantly reduced their Iranian oil imports, large importers like Japan, Korea, Turkey, India, and China managed to secure for their banks a temporary exemption from U.S. banking sanctions. So banks could keep facilitating oil-related payments for Iran without being cut off from the dollar-based payments system. The result was that Iran's oil exports fell, but never ground to a halt. This was a fairly balanced approach. While the U.S. wanted to deprive Iran of oil revenue - which might be used to build nuclear weapons - it didn't want to force allies to do entirely without necessary crude oil. The U.S. Iran Threat Reduction & Syria Human Rights Act of 2012 (TRA) further tightened the noose. The TRA prevented Iran from repatriating any of the oil & gas funds that were accumulating in foreign escrow accounts maintained in Turkey, Japan, and elsewhere. To enforce this restriction, any bank proven to repatriate Iranian oil money would be cut off by its U.S. correspondent bank, thus losing its connection to the U.S. banking system. The inability to unlock funds was inconvenient for Iran. There was no useful purpose to which the pariah nation could put all the Japanese yen, Indian rupees, Chinese yuan, or Turkish lira that was piling up in its overseas escrow accounts. Iran could still buy non-sanctioned goods and services in these countries and bring them back to Iran, say food, medicine, and whatnot. But none of the oil-importing nations provided Iran with enough importable stuff that it could draw its account balances down to zero. The funds held in escrow were dead money. This is where gold was recruited as a useful payments rail for evading the sanctions. The scheme was carried out primarily through Turkey. Gold dealer Reza Zarrab, one of the most well-known expediters of the scheme, designed an escape hatch for Iranian funds along with bank officials at Halkbank, a Turkish state-owned bank. Iranian funds frozen in a Halkbank escrow accounts (denominated in Turkish lira) were transferred to accounts held at Halkbank by Zarrab's shell companies and used to buy gold in the Turkish gold market. This technically was not illegal. While an earlier set of sanctions had prohibited banks from directly helping the Iranian government to deal in gold, it was still legal for them to help “private” persons to access gold, as long as the gold was sent to Iran and not elsewhere. Zarrab sent some of this gold directly to Iran. The rest was exported to Dubai where it was sold for dollars, the cash being returned to Turkey where Zarrab laundered it back into the banking system. Now the Iranian government could finally make use of it. Below is a chart that Zarrab made at his 2017 court trial that illustrates the complexity of the gold trade. This size of this loophole was significant. According to Reuters, Turkish gold exports to Iran exploded from one tonne in 2011 to 125.8 tonnes in 2012, worth $6.5 billion. Another $4.6 billion was sent to Dubai, most of this ultimately destined for Iran. Below I've charted Turkish gold exports from 2008 to present. You can see the big bulge in 2012-13. The large inflow of Turkish gold helped keep Iran afloat. It was only in mid-2013 that the "private person" loophole was finally cut off. Banks like Halkbank, which before could only be penalized for engaging in gold dealings with the Iranian government, were now prohibited from enabling gold payments for private Iranian entities as well. Gold shipments out of Turkey slowed to a trickle. While Zarrab continued to illegally export small amounts of gold, he focused on a different form of sanctions busting: moving Iranian funds locked in Turkey to Dubai by using fake invoices for food and medicine as cover. But this too came to an end. During a visit to Disney World with his family in 2016, Zarrab was arrested and accused of helping Iran evade U.S. sanctions. In late 2017, he accepted a plea agreement and became the key witness against a number of Halkbank officials and Turkish government officials. Only one of them, Mehmet Atilla, has been convicted to date, the rest remain at large. In theory, the funds held in Iran's escrow accounts at Halkbank could have been used to buy any sort of commodity, say copper, and then the copper shipped to Iran (or Dubai). The reason that gold was probably chosen as the in-between commodity is because it has a higher value-to-weight ratio than most commodities. Whereas an ounce of gold conveys $1300 in value, it would have required around 6,500 ounces of copper to convey $1300 in value. The extra bulk involved would have been very costly to ship. Another advantage of gold relative to other commodities is that it is highly liquid. There are markets for the yellow metal all over the world that attract the participation of a wide range of buyers from consumers to industrial users to jewelers. Copper is much less marketable. Because Iran needed to on-sell whatever commodity was being used as the in-between commodity in order to get hard currency like euros and dollars, gold would have been the most convenient option. A Monetary Blockade in 2018? The monetary blockade that began in 2010 was eventually successful. Iran was forced to come to the negotiating table and in 2015 the Iran nuclear deal was signed. Zoom forward to today. Trump has left the nuclear deal and is threatening to reimpose sanctions against Iran. Could gold once again become a player in the game played between sanctioner and sanctioned? One major difference between then and now is that there was significant global buy-in during the last round of sanctions. Prior to setting up the monetary blockade, the U.S. gained support from the United Nations Security Council, including China and Russia. So while certain loopholes were exploited, a broad consensus meant that evasion was not prevalent enough to bring the whole edifice down. In exiting the Iran deal last month, Trump has done so alone. Presumably this lack of consensus will make any ensuing round of sanctions much more leaky than the initial ones. India, for instance, has already said that it won't comply with the sanctions because they are not UN-mandated. Now, in actuality there probably isn't much India can do to escape the sanctions. The majority of Indian banks will comply because they will be wary about the threat of being cutoff from the dollar-based payments system. But with a wink and a nod from their national governments, a few banks who don't do much U.S. business may decide to take Iran on as a customer. They will need some sort of popular medium for expediting payments to and from Iran, say gold, euros, bitcoin, or an up-and-coming national currency such as the Chinese yuan. It remains to be seen which one would be selected, but gold certainly has a number of useful properties, as evidenced by the last round of sanctions. Whatever the case, the U.S. dollar's dominant role as a global medium of exchange can only be weakened by another round of Iran sanctions. Turkey’s economy has been in a tailspin with an inflationary currency, but the country is using something rare to help stabilise itself: gold. In late 2011, Turkey started to allow commercial banks to use gold instead of the Turkish lira for their required deposits at the central bank. These deposits are known as reserve requirements and help ensure that the banks are capitalised. Over the past six-or-so years, Turkey’s central bank has accumulated an additional 400 metric tonnes of gold. That’s a lot of yellow bricks – more than what Britain has – and the sizeable stash has the possibility to take the edge off the crisis. To put the Turkish gold haul in perspective, there are 10 million ounces of gold – roughly 311 tonnes – at the Bank of England, according to the New York-based financial consulting firm CPM Group. The burgeoning balance of bullion comes as the result of a change in banking rules made earlier this decade. In the simplest terms, the tweak to the rules allows gold to be used as a financial asset by the banks. In addition, the new regulation helped flush out a lot of gold that was previously held privately. “This change allowed the government to get hold of the under-the-mattress gold to help stabilise the banks and the underlying economy,” says Ivo Pezzuto, professor of global economics, entrepreneurship, and disruptive innovation at the International School of Management, Paris, France. The result of the policy change has been that Turkey’s central bank has seen a huge jump in its apparent gold holdings. There are now more than 18 million troy ounces of bullion deposited at Turkey’s central bank, up from less than four million before the rule change was introduced in 2011, according to the latest data from CPM Group. There are 32,150.7 troy ounces in a metric tonne. Almost all of the increase came from commercial bank deposits of the metal at the central bank, rather than government purchases to bolster national reserves. The Turkish gold, which previously would have languished under the proverbial mattresses, or in private safety deposit boxes, now serves a more useful economic purpose in allowing the banks to make more lira-based loans. It also helps the banks during times of high inflation. With inflation running at a 40 percent annualised rate, the value of the gold grows as well when measured in terms of lira. In short, the commercial banks’ deposits of gold become worth more and more in terms of the local currency as inflation rages onward and upwards. Although the purchasing power of the local currency dwindles with each passing day of double-digit inflation, the gold’s value does not. For instance, while one dollar fetched 4.10 lira a month ago, it will now buy 4.53 lira, meaning the lira has fallen in value. Whereas, gold prices in dollars have remained roughly static versus the beginning of the same period. So what does this all mean? It means that managers at commercial banks don’t have to worry as much about continually sending more deposits to the central bank to maintain the required reserves. The value of the gold naturally adjusts upwards, meaning if the bank is growing its loan book, it doesn’t need to worry as much about stashing more cash with the central bank. Put another way, it automatically can help stabilise the banks’ finances – at least in theory. However, it is also worth remembering that the government does not own these additional gold reserves. They are the assets of the commercial banks and/or those of the investors who deposited their bullion with the financial institution. That in turn means that private investors have the choice to get their gold returned to them. It’s basically the same as someone taking cash out of a deposit account. It is also true that everyone taking their cash out would likely cripple a bank. Similarly, although not identical, it is true with the gold that the investors deposited. If everyone took out their gold then the banks would need to immediately send a slew of Turkish lira to the central bank, which is theoretically possible. However, Turkey’s implementation of gold deposits may not offset its economic problems in the long run. Turkey has a credit problem, which Middle East Eye reported last September. The economy grew too rapidly and sparked high inflation. Ballooning inflation has led to the dwindling value of the lira. One dollar would fetch 4.48 Turkish lira recently versus 3.52 lira on 1 June 2017, according to data from Bloomberg. While the official rate of inflation was an annualised 10.85 percent in April, which seems relatively measured for the economy, it may not reflect reality. A more realistic rate is likely 40 percent, according to estimates from Steve Hanke, professor of applied economics at Johns Hopkins University, and also an expert on inflation. He uses a technique known by economists as purchasing-power-parity, which looks at the actual cost of goods and services inside Turkey. The plunging currency has come hand-in-glove with a scramble for the exits by investors who wish to save their capital from the wealth-withering surge in the cost of living. In other words, they have sold their lira-denominated investments in favour of US dollars and other major currencies that aren’t suffering from high inflation. “Basically the problem is that inflation is very high and they don’t want to slow the economy in order to crush the inflation,” Pezzuto says. Those two policies tend not to go hand in hand, so observers are anticipating more inflation for the time being. The Swiss government pension fund, Switzerland’s AHV/AVS fund, has decided to diversify into physical gold bars in their substantial CHF35.2bn (€30.5bn) pension portfolio. At the end of last week the first pillar buffer fund tendered a custodianship and storage for CHF 700m (EUR 600m / USD 700m / GBP 525m) in gold bars via IPE Quest. The bars are to be stored in Switzerland either collectively or individually, the tender (QN-2447) states. The tender marks a shift in the investment strategy for AHV/AVS, as it previously only invested in gold and silver via swaps. “The supervisory board has decided we are to invest in physical gold bars from now on,” the fund told IPE in a statement. In 2016 the supervisory board of the buffer fund decided to raise its the commodities exposure from 1% to 2% while divesting from energy-related commodity exposure. The fund explained last year that gold was better suited to add “diversification and hedging in certain situations (inflation or recession)” than the previously preferred energy commodities. In March the investment committee confirmed the decision to change the precious metal mandate from swaps to physical gold. No further details were given on the mandate or the shift in strategy. As per March 2018, the fund held CHF682m in gold and a minor investment in silver, with a target allocation to precious metals of 2%. This means by year-end the swaps exposure to silver would have to be phased out and the precious metal portfolio would consist of physical gold only. - Are Gold And Silver Bullion Obsolete In The Crypto Age? The tangible quality of gold bullion is one of the key factors which contributes to gold’s ability to act as a form of financial insurance for investments, savings and wealth throughout history and again in recent months and years. Gold is one of the rarest elements in the world, making up roughly 0.003 parts per million of the earth’s crust. But how much gold is the world digging up each year and what countries produce the most? In 2017, global gold mine production was a reported 3,247 tonnes. This figure is down 5 tonnes from the previous year and marks the first annual drop since 2008, according to the GFMS Gold Survey 2018. The driving forces behind the drop in output were environmental concerns, crackdowns on illegal mining operations and rising costs. This raises the question I’ve explored recently – have we reached peak gold? The idea is that all the easy gold has already been discovered and explorers have to dig deeper to find economically viable deposits. For example, South Africa was once the top gold-producing country by far, digging up over 1,000 tonnes in 1970, but annual output has fallen steadily since. On the other hand, several nations have emerged in the last few years as growing gold producers. China and Russia have both seen production in an overall upward trend. As seen in the chart below, China takes the number one spot of global gold producers by a wide margin, extracting 131 tonnes more than second place Australia. The top 10 rankings remained unchanged from 2016 to 2017, with the exception of Canada and Indonesia switching between fifth and seventh place, respectively. Of the top producers, Russia posted the largest annual gain, boosting output by 17 tonnes. Below are more details on the top 10 countries with the largest gold production in 2017, beginning with the top producer and top consumer of bullion, China. For many years China has been the top producing nation, accounting for 13 percent of global mine production. Production fell by 6 percent last year due to escalated efforts by the government to fight pollution and raise environmental awareness. However, production is expected to pick back up this year due to several mine upgrades at existing projects. Although gold production increased 5 tonnes from the previous year in Australia, MinEx Consulting released a report detailing an expected drop between 2017 and 2057 unless the amount spent on exploration is doubled. The minerals industry produces over half of Australia’s total exports and generates about 8 percent of GDP. A massive 83 percent of European gold comes from Russia, which has been increasing its production every year since 2010. The nation increased output by 17 tonnes last year, even as the ruble appreciated 13 percent, which hurts producers with weaker revenue growth relative to the cost of production. Who is the largest buyer of Russian gold? The Russian government, of course, which purchases around two-thirds of all gold produced locally. Gold output rose by 8 tonnes in the U.S. last year, marking the fourth consecutive year of annual increases. Production was supported by project ramp-ups at the Long Canyon project in Nevada and the Haile project in South Carolina. Around 78 percent of American gold comes from Nevada alone. Canada inched up two spots on the list in 2017, producing 10 more tonnes of gold than the previous year. Toronto based Seabridge Gold stumbled upon a significant goldfield in northern British Colombia after a glacier retreated and is estimated to contain a whopping 780 metrics tonnes. This could be a source of increased output in the coming years. Gold output fell for the second consecutive year in Peru, by 6 tonnes, largely due to crackdowns on illegal mining operations in the La Pampa region. Mining is a significant portion of Peru’s economy and the nation is also number three in the world for copper production. Production in the archipelago nation fell by 11.7 percent, dropping to number seven on the list of top global producers. The Indonesian government introduced a tax amnesty program that hoped to repatriate money from overseas, which led to production falling at new main sites as traders were reluctant to remain in the mining industry. Once the top gold-producer in the world by a wide margin, South Africa’s gold mines have been slowing every year since 2008, with the exception of 2013 when production rose by a few tonnes. The nation is still home to the world’s deepest gold mine, the Mponeng mine, extending 2.5 miles underground. Although production fell three tonnes from 2016 to 2017, Mexico remains a competitive gold source. Output has risen from just 50.8 tonnes in 2008 to over 130 tonnes last year, one of the largest increases in a nine year span. Mexico is an attractive place for mining due to a relatively low cost of regulation. Ghana is Africa’s second largest producer of gold and is also known for its reserves of various industrial minerals. Bullion production rose 7 tonnes over the previous year and accounts for over 20 percent of the nation’s total exports. Holdings may change daily. Holdings are reported as of the most recent quarter-end. The following securities mentioned in the article were held by one or more accounts managed by U.S. Global Investors as of 03/31/2018: Seabridge Gold Inc., Goldcorp. Bloomberg, Reuters and other media are now reporting that Russia dumped Treasuries in a major way in April and today comes news that Russia bought another 600,000 ounces of to add to its already sizeable and growing gold reserves. This is something we have written about since 2004 and have spoken about on Bloomberg TV, CNBC etc for many years. It is not just Russia that is diversifying into gold in recent months and years. India, Turkey, Mexico, Iran, Kyrgyzstan, Kazakhstan, Belarus, Uzbekistan, Tajikistan, Mongolia and of course China have been increasing their gold reserves. Trump’s erratic and risky economic and foreign policies pose a risk to the dollar as the reserve currency of the world. We are moving to a multi polar world which will see China become a more dominant player and Trump is exacerbating this trend. The risk for the US and global economy is that if trade wars intensify with China, Russia and other nations then this trend may deepen. This would likely lead to a lower dollar, higher interest rates and much higher inflation. It is creating a very bullish scenario for gold and the present bout of weakness presents a buying opportunity for value minded investors to diversify and accumulate gold while it remains weak. Have We Seen The Bottom On Gold Prices for 2018? As U.S. gold exports to Hong Kong and China fell 25% in the first four months of the year, London picked up the slack. According to the USGS, U.S. gold exports to London surged more than doubled from January to April, compared to the same period last year. Interestingly, the amount of gold exported to London during this period nearly equaled the total U.S. domestic gold mine supply. As I have mentioned, a lot London’s gold is exported to China and Switzerland. And then, the majority of Switzerland’s gold is exported to Hong Kong and China. For example, according to the statistics on GoldChartsrus, in March, the U.K. exported 16 mt of gold to China and 32 mt of gold to Switzerland. 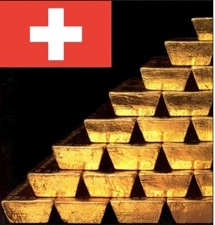 In the very same month, Switzerland exported 80 mt of gold to Hong Kong and China. So, most of the west’s gold still ends up in Hong Kong and China. IMPORTANT NOTICE: I will be publishing a new video the BIG PROBLEMS in the Gold Mining Industry. If you haven’t subscribed to my youtube channel, please consider doing so at the following link: SRSrocco Report YouTube Channel. Gold's Losing Streak May Get Worse? !